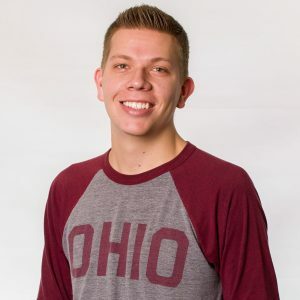 Fourth year Trent Schroeder gave Student Life’s communications team an exclusive look at his Ohio State experience in a thoughtful personal essay. Discover what makes him a unique and truly extraordinary Buckeye – and walk around his home away from home, the Ohio Union, with him at the end! As a senior at Ohio State, I’m studying Information Systems in the Fisher College of Business. This major has been a perfect fit for me, as I love the hybrid of business and technology! I recently accepted a job offer with Epic in Madison, Wisconsin, and look forward to starting my career as a project manager. Outside of the classroom, I can usually be found in the Ohio Union! I began working part-time in the building during my freshman year and have become a Building Manager. Now, I aid in creating the best experience possible for our guests by maintaining cleanliness, ensuring smooth operations and supporting the student organizations and visitors that make our building so special. Working in the Ohio Union has given me incredible opportunities to develop as a communicator, team player and leader. I’m also involved in the Ohio Union Activities Board (OUAB). As a member of the Collaborative Events Committee, I work with student organizations to bring their dream events to campus. OUAB has ignited my passion for bringing new ideas to campus and providing opportunities for students to see the world in new ways. This past February, I participated in BuckeyeThon. After fundraising for months, BuckeyeThon culminates in a 24-hour dance marathon at the Ohio Union. I raised more than $800 by collecting donations at my annual computer-controlled Christmas light show at my parents’ house in Findlay, Ohio. “Trent’s Christmas Light Show” has been a personal hobby of mine for the past six years and I’m so glad I could use it to benefit the children being treated in the Hematology, Oncology and Bone Marrow Transplant departments at Nationwide Children’s Hospital this year. Involvement outside the classroom has been such a meaningful component of my education, and my best advice for younger students is to find their own ways get involved! Take risks and engage yourself in something that might challenge you to see the world from a new perspective. Surround yourself with people that are different from you and be open to new ideas. I am incredibly grateful for all the experiences I’ve gained, and the people I’ve met by getting involved. Inside and outside of the classroom, I couldn’t be more thankful for my Ohio State experience. Fisher’s top-ranked courses have been the core of my education, but my involvement with the Ohio Union and OUAB have developed me as a global citizen. I wouldn’t trade these experiences for the world, and I am proud to be a Buckeye for life. Posted by koewler.9 at 3:17pm March 21, 2018 Bookmark the permalink.